Marin Cilic (7), Croatia, def. Hubert Hurkacz, Poland, 6-2, 6-0, 6-0. Alex De Minaur, Australia, def. Frances Tiafoe, United States, 6-4, 6-0, 5-7, 6-2. Jan-Lennard Struff, Germany, def. Julien Benneteau, France, 6-2, 4-6, 6-1, 3-6, 6-3. David Goffin (10), Belgium, def. Robin Haase, Netherlands, 6-2, 6-7 (1), 6-3, 6-2. Diego Schwartzman (13), Argentina, def. Jaume Antoni Munar Clar, Spain, 6-2, 6-0, 5-7, 6-2. Kei Nishikori (21), Japan, def. Gael Monfils, France, 6-2, 5-4, ret. Philipp Kohlschreiber, Germany, def. Matthew Ebden, Australia, 6-7 (1), 6-3, 6-2, 6-0. Alexander Zverev (4), Germany, def. Nicolas Mahut, France, 6-4, 6-4, 6-2. Novak Djokovic (6), Serbia, def. Tennys Sandgren, United States, 6-1, 6-3, 6-7 (2), 6-2. Richard Gasquet (26), France, def. Laslo Djere, Serbia, 6-3, 7-6 (5), 6-3. Lucas Pouille (17), France, def. Marcos Baghdatis, Cyprus, 6-7 (4), 6-4, 6-4, 6-3. Joao Sousa, Portugal, def. Pablo Carreno-Busta (12), Spain, 4-6, 6-3, 5-7, 6-2, 2-0, ret. John Millman, Australia, def. Fabio Fognini (14), Italy, 6-1, 4-6, 6-4, 6-1. Mikhail Kukushkin, Kazakhstan, def. Hyeon Chung (23), Republic of Korea, 7-6 (5), 6-2, 6-3. Nick Kyrgios (30), Australia, def. Pierre-Hugues Herbert, France, 4-6, 7-6 (6), 6-3, 6-0. Roger Federer (2), Switzerland, def. Benoit Paire, France, 7-5, 6-4, 6-4. Caroline Garcia (6), France, def. Monica Puig, Puerto Rico, 6-2, 1-6, 6-4. Carla Suarez-Navarro (30), Spain, def. Kristina Mladenovic, France, 6-1, 4-6, 6-4. Jelena Ostapenko (10), Latvia, def. Taylor Townsend, United States, 4-6, 6-3, 6-4. Madison Keys (14), United States, def. Bernarda Pera, United States, 6-4, 6-1. Aleksandra Krunic, Serbia, def. Kirsten Flipkens, Belgium, 6-1, 6-3. Dominika Cibulkova (29), Slovakia, def. Su-Wei Hsieh, Taiwan, 7-6 (3), 4-6, 6-4. Angelique Kerber (4), Germany, def. Johanna Larsson, Sweden, 6-2, 5-7, 6-4. Petra Kvitova (5), Czech Republic, def. Yafan Wang, China, 7-5, 6-3. Aryna Sabalenka (26), Belarus, def. Vera Zvonareva, Russia, 6-3, 7-6 (7). Naomi Osaka (20), Japan, def. Julia Glushko, Israel, 6-2, 6-0. Aliaksandra Sasnovich, Belarus, def. Daria Kasatkina (11), Russia, 6-2, 7-6 (3). Kiki Bertens (13), Netherlands, def. Francesca Di Lorenzo, United States, 6-2, 6-1. Marketa Vondrousova, Czech Republic, def. Eugenie Bouchard, Canada, 6-4, 6-3. Katerina Siniakova, Czech Republic, def. Ajla Tomljanovic, Australia, 6-3, 6-7 (3), 7-6 (4). Lesia Tsurenko, Ukraine, def. Caroline Wozniacki (2), Denmark, 6-4, 6-2. Julio Peralta, Chile and Horacio Zeballos (13), Argentina, def. Frederik Nielsen, Denmark and Joe Salisbury, Britain, 6-4, 6-2. Artem Sitak, New Zealand and Divij Sharan, India, def. Martin Redlicki, United States and Evan Zhu, United States, 6-4, 6-4. Lukasz Kubot, Poland and Marcelo Melo (7), Brazil, def. Andreas Siljestrom, Sweden and Hans Hach Verdugo, Mexico, 6-3, 7-6 (2). Bruno Soares, Brazil and Jamie Murray (4), Britain, def. Albert Ramos-Vinolas, Spain and Guido Pella, Argentina, 6-2, 6-3. Maximo Gonzalez, Argentina and Nicolas Jarry, Chile, def. Marcin Matkowski, Poland and David Marrero Santana, Spain, 6-3, 6-4. Roman Jebavy, Czech Republic and Andres Molteni, Argentina, def. Evan King, United States and Nathan Pasha, United States, 6-4, 6-4. Andreas Seppi, Italy and Matteo Berrettini, Italy, def. Jan-Lennard Struff, Germany and Ben Mclachlan (12), Japan, 7-6 (5), 1-6, 6-4. Franko Skugor, Croatia and Dominic Inglot (16), Britain, def. Rajeev Ram, United States and Robert Lindstedt, Sweden, 6-4, 7-6 (9). Dusan Lajovic, Serbia and Stefanos Tsitsipas, Greece, def. Diego Schwartzman, Argentina and Cameron Norrie, Britain, 3-6, 6-4, 6-1. Mike Bryan, United States and Jack Sock (3), United States, def. Daniele Bracciali, Italy and Marco Cecchinato, Italy, 6-1, 6-1. Robert Farah, Colombia and Juan Sebastian Cabal (5), Colombia, def. Denis Istomin, Uzbekistan and Jeevan Nedunchezhiyan, India, 6-3, 6-2. Robert Galloway, United States and Nathaniel Lammons, United States, def. Kevin King, United States and Reilly Opelka, United States, 6-2, 6-2. Fabrice Martin, France and Jeremy Chardy, France, def. James Cerretini, United States and Leander Paes, India, 6-3, 6-4. Henri Kontinen, Finland and John Peers (2), Australia, def. Miguel Angel Reyes-Varela, Mexico and Marcelo Arevalo-Gonzalez, El Salvador, 5-7, 7-6 (2), 7-6 (5). Bethanie Mattek-Sands, United States and Lucie Safarova, Czech Republic, def. Zarina Diyas, Kazakhstan and Saisai Zheng, China, 6-3, 7-6 (5). Monica Niculescu, Romania and Irina-Camelia Begu (15), Romania, def. Natela Dzalamidze, Russia and Jelena Ostapenko, Latvia, 6-3, 7-6 (5). Nina Stojanovic, Serbia and Fanny Stollar, Hungary, def. Katarina Srebotnik, Slovenia and Vania King (11), United States, 6-7 (8), 6-4, 6-2. Vitalia Diatchenko, Russia and Margarita Gasparyan, Russia, def. Sachia Vickery, United States and Sofia Kenin, United States, 1-6, 6-2, 6-3. Demi Schuurs, Netherlands and Elise Mertens (7), Belgium, def. Petra Martic, Croatia and Daria Gavrilova, Australia, 6-3, 5-7, 6-2. Barbora Strycova, Czech Republic and Andrea Sestini Hlavackova (3), Czech Republic, def. Allie Kiick, United States and Jamie Loeb, United States, 6-1, 7-5. Raluca-Ioana Olaru, Romania and Xinyun Han, China, def. Tatjana Maria, Germany and Heather Watson, Britain, 6-3, 6-3. Coco Vandeweghe, United States and Ashleigh Barty (13), Australia, def. Qiang Wang, China and Yafan Wang, China, 6-3, 6-0. Johanna Larsson, Sweden and Kiki Bertens (9), Netherlands, def. Kaia Kanepi, Estonia and Andrea Petkovic, Germany, 6-2, 6-4. Anastasia Pavlyuchenkova, Russia and Anastasija Sevastova, Latvia, def. Andreja Klepac, Slovenia and Maria Jose Martinez Sanchez (5), Spain, 6-3, 7-5. Magdalena Rybarikova, Slovakia and Viktoria Kuzmova, Slovakia, def. Olga Savchuk, Ukraine and Elina Svitolina, Ukraine, 6-2, 7-5. Naomi Broady, Britain and Danielle Rose Collins, United States, def. Makoto Ninomiya, Japan and Miyu Kato (16), Japan, 6-3, 6-4. Yifan Xu, China and Gabriela Dabrowski (4), Canada, def. Renata Voracova, Czech Republic and Lara Arruabarrena-Vecino, Spain, 6-2, 6-7 (5), 6-1. Lucie Hradecka, Czech Republic and Ekaterina Makarova (6), Russia, def. Kaitlyn Christian, United States and Rebecca Peterson, Sweden, 6-2, 6-3. Latisha Chan, Taiwan and Victoria Azarenka, Belarus, def. Ana Bogdan, Romania and Yulia Putintseva, Kazakhstan, 6-4, 4-6, 6-4. Nicole Gibbs, United States and Sabrina Santamaria, United States, def. Alexa Guarachi Mathison, Chile and Vera Lapko, Belarus, 6-1, 1-6, 6-1. Gabriela Dabrowski, Canada and Mate Pavic (1), Croatia, def. Noah Rubin, United States and Jamie Loeb, United States, 6-0, 6-4. Rajeev Ram, United States and Kveta Peschke, Czech Republic, def. Marc Lopez, Spain and Lara Arruabarrena-Vecino, Spain, 6-4, 6-3. Edouard Roger-Vasselin, France and Andrea Sestini Hlavackova (5), Czech Republic, def. Marcelo Demoliner, Brazil and Maria Jose Martinez Sanchez, Spain, 7-6 (8), 6-1. Nadiia Kichenok, Ukraine and Wesley Koolhof, Netherlands, def. Donald Young, United States and Taylor Townsend, United States, 6-1, 7-5. Franko Skugor, Croatia and Raluca-Ioana Olaru, Romania, def. Danielle Rose Collins, United States and Tom Fawcett, United States, 3-6, 6-4, 10-3. Christopher Eubanks, United States and Cori Gauff, United States, def. Henri Kontinen, Finland and Hao-Ching Chan (3), Taiwan, 6-4, 6-4. Shuai Zhang, China and John Peers, Australia, def. Matwe Middelkoop, Netherlands and Demi Schuurs (6), Netherlands, 4-6, 6-3, 10-8. Santiago Gonzalez, Mexico and Anna-Lena Groenefeld, Germany, def. Aisam Qureshi, Pakistan and Raquel Atawo, United States, 6-3, 6-2. 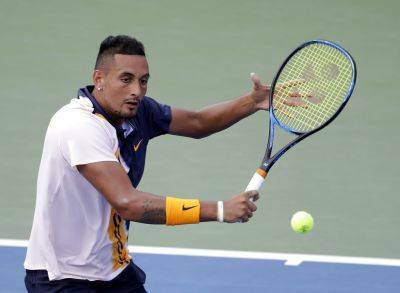 What there’s never been a doubt about, however, is Kyrgios’ talent and ability to entertain — when he puts his mind to it. He burst onto the scene by stunning Rafael Nadal as a teenager at Wimbledon in 2014, and he owns a victory over 20-time major champion Federer, too. After reaching the third round by defeating Benoit Paire 7-5, 6-4, 6-4, Federer criticized Lahyani for going to talk to Kyrgios for as long as he did, and from as close as he did. Normally, a chair umpire leans over from his or her post to speak to a seated player during a changeover. It was, to be sure, the most conversation-worthy topic on Day 4 at Flushing Meadows. Past U.S. Open champions Novak Djokovic and Marin Cilic won, while 2006 titlist Maria Sharapova played Sorana Cirstea of Romania in Thursday’s last Ashe match, and two-time finalist Caroline Wozniacki was also in action at night. Three seeded men departed earlier, with No. 12 Pablo Carreno-Busta, a semifinalist in 2017, stopping in the fifth set of his match with a leg injury, while No. 14 Fabio Fognini lost to John Millman 6-1, 4-6, 6-4, 6-1, and No. 23 Hyeon Chung was beaten by Mikhail Kukushkin 7-6 (5), 6-2, 6-3. The 11th-seeded woman, Daria Kasatkina, was eliminated by Aliaksandra Sasnovich, but 2016 champion Angelique Kerber, 2017 runner-up Madison Keys and two-time Wimbledon champ Petra Kvitova all won. Djokovic wasted a third-set match point and was pushed to a fourth before defeating American Tennys Sandgren 6-1, 6-3, 6-7 (2), 6-2.